Note: The file may be detected as virus because it was packed using a software that is not known by the anti-virus. Please exclude your Trickster Folder from your anti-virus. Malwarebytes and Windows Defender do not detect this game as virus, so you may just want to use these programmes on your computer. For those who are having problems logging in, please follow this mini-guide. Problem 1. My Splash.exe is all white! I cannot update or do anything of the sort, and get the error "Cannot connect to update server!" -- This is caused by the lack of Microsoft C++ on your computer. 2. If you do not already have Winrar or 7zip or anything to extract a .zip file, please download so now. 3. When the download for the mega file is complete, open it. 4. Now, you want to highlight all of these files, and drag them directly into your PlayTrickster Folder. This should then prompt unzipping, and then it will ask you to replace files. Select yes to all. You want to replace all the files. 5. Run vc_redist_2015x86.exe as administrator now. Install this, and when it is complete, restart your computer. This should fix it! Problem 2. When I click Game Start, nothing happens! My client closes! OR, when I try to log in, the game freezes! -- This is compatibility issues. 1. Go to your PlayTrickster folder, and right click Splash.exe, go into Compatibility, and check that it looks EXACTLY like this one:http://puu.sh/p8xOu/889ceacd5f.png. If it does not, please fix it. 2. Now, run Splash.exe as administrator, and do "Check Files". 3. The client should then update or download some files, then Game Start should be lit up at this point. 4. Now, hit Game Start, and try to log in. Problem 3. I can get by Splash.exe, but when the game loads, I get a white screen and "Exceptional Error"! -- This is an issue with the screen resolution currently selected for Trickster. 1. Run Splash.exe as administrator, as normally. 3. Once you can again, click on Options. 4. 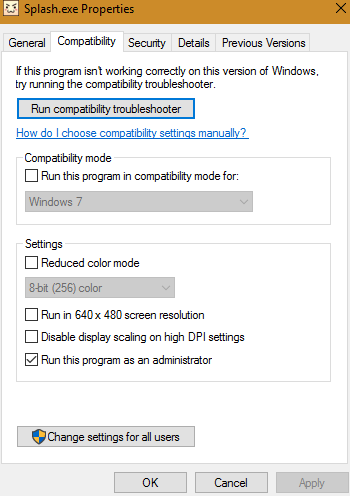 Change your resolution from whatever it currently is to either 800x600 or 1024x768.